Lets get one thing out the way first. If you don't follow Sincerely Jules then you really must do something about that now. She has an incredible blog and it's packed full of inspiring images. My new ring was bought via her site. She featured her collaboration with jeweller Gabriela Artigas way back in December and I fell in love. 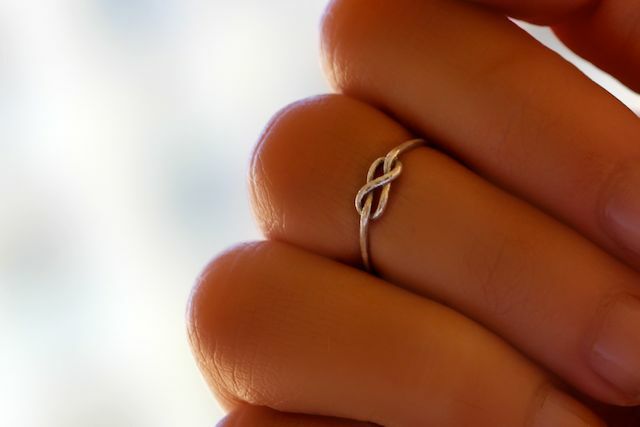 A tiny infinity knot, it is designed to sit above the knuckle. I contemplated it for a few weeks before ordering and I finally picked it up when I went back to the UK this weekend. (I think) I ordered a size 5 and have decided to wear it on the same finger as my Sydney Evan "love" ring. It's a little odd/scary wearing a ring that sits on this part of the finger. Whenever I wash my hands I am petrified of watching it fall down the plughole but for whatever reason it appears to be staying put. Now this particular ring is now sold out (although Gabriela has other lovely rings! )and it would be remiss of me as a blogger not to mention that you can pick up something identical for a relatively low price on Etsy. I haven't used this seller before - although I am thinking about buying a couple more of these as I like the way they look either stacked or worn across three fingers...pure greed I tell you! :) - but her feedback is positive, she is called Laura :) and it's $21 as oppose to $70. love knot rings, been in love with this one foreverrrr! love that. love the heavier finish! that remains one of my favourite and most cherished pieces. well worth saving up for! I'd be so paranoid about it falling off my finger but it's such a pretty ring and really interesting so perhaps I need to put my paranoia in a little box and lock it in my mind. Ahh stop introducing me to amazing things that are going to break my bank balance! yes! that's how i felt at first...constantly checking that it was still there. i think there is "fall off" potential but it's pretty secure. I highly recommend! oooooh i love it! its so dainty and feminine!! Thanks Jennifer :) Highly recommend the purchase! Love the delicateness of the Jules ring. I particularly like how the band comes out and over the knot loops on both sides. :) These pictures are lovely. I love this, so dainty and pretty. A bit of simplicity is nice sometimes for a change. I do like rings worn up on the top of the finger too. I'm going to go browse that site now, thanks for helping me probably spend more money!! Ha! 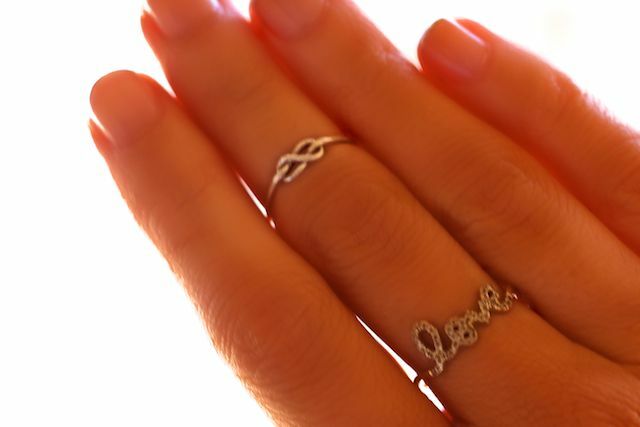 Love where the ring sits on your finer and looks great with the love ring too! This is gorgeous, I really want one of these rings but I'd be terrified of it falling off! Love this! I'm going to have to purchase the etsy one now. But how did you know what size to get? This is so pretty! I've been looking at similar rings but never seen one that you wear so high up on the finger. Like you, I'd be afraid of it falling off. I think it would take some getting used to! i love it! how delicate is that! so you for sure!! xxxi am checking it right now! Gorgeous! Reminds me of my knot ring that I NEVER take off.. I love this girl's blog too, I wish she would do more home posts...her place is lovely! Such dainty piece! I need one of these in my life! Oh I love it, I've never seen a ring to wear above the knuckle on purpose. That usually happens when I try on something too small... I would also worry about losing it! i love that little ring, it makes such a statement! I love the design on the ring. So simple & delicate. Although, I would be terrified of it falling off my finger! A perfect everyday ring. The simple thin gold bands from catbird are also on my list. That is such a pretty ring and I love the idea of wearing two on one finger like that. Such a great idea! Thank you so much for linking to my rings! I've had a few of your readers come by and purchase their own- such an honor to be creating jewelry for so many fashionistas! The personal packaging is wonderful and I love the ring but I would like it to sit at conventional part of my finger. It's so delicate and pretty! Just stumbled across your blog and I LOVE it. 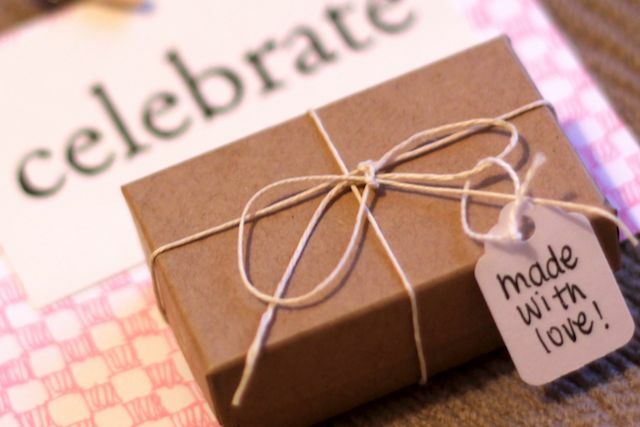 The ring is beautiful (as is the packaging) and how cute for them to have written a card as well- the little things make all the difference! Such a lovely ring ! Definitely going to take a look at the website ! That ring is adorable! But I think I would have the same problem - being afraid it would fall off my fingers when ever I washed my hands! that is lovely, thanks for sharing! by the way - what nail polish color are you wearing? i really like it! I've never seen anything like that, it's pretty! woah - cute. never seen that before! Does it feel strange having something on that part of your finger? Hi Jeni - it did at first but now I don't even notice it's there! I think the ring is very elegant and beautiful. I ordered from Laura [from Indulgent Designs on Etsy.com] per your blog post. She is amazing, and the ring I ordered is lovely. It is great quality and an excellent price. Tungsten RingI have made up before we had looking at wedding bands: a plain white gold band and diamond ring it choice women's ring 6 mm my engagement ring. Tungsten rings for men are perfect not just as a wedding ring, mad tungsten offers wicked tungsten men’s rings. Order men’s wedding ring today Free Shipping. I have visited a immeasurable electronic computer however you're the only that I even have ever seen, its terribly awful. What does one suppose makes the Celtic band thus common these days? it's after all the planning of the ring that gives a typical mix of history, tradition and symbolism. You might also think about choosing an animal interlace ring, which symbolizes the relationship between a woman and a man. No matter if you are choosing a Celtic knot ring for religious or cultural reasons, or just because their intricate designs are appealing, just knowing that the ring will be unique, will make the recipient know you choose it especially for them. informative,interesting which was i am looking for . please keep updating step by step . A piece of rings jewellery is the perfect way to enhance your everyday life.